I am always on the search for a new series to watch, a new album to listen to, a new place to visit and of course a new book to read. But when I do any of these I always need it to be something that triggers something in me, I cannot abide blandness, life’s to short to be stuck doing the same mundane things. So in my quest for the unfamiliar there is nothing better than an alternate timeline. This fantastic book not only takes p[lace in an alternate history but in one where the allies lost World War 2. Now before you criticize this by stating that it would virtually impossible for the allies to have lost the war, I want you to focus on the word virtually, yes it would be near impossible but it was still possible. 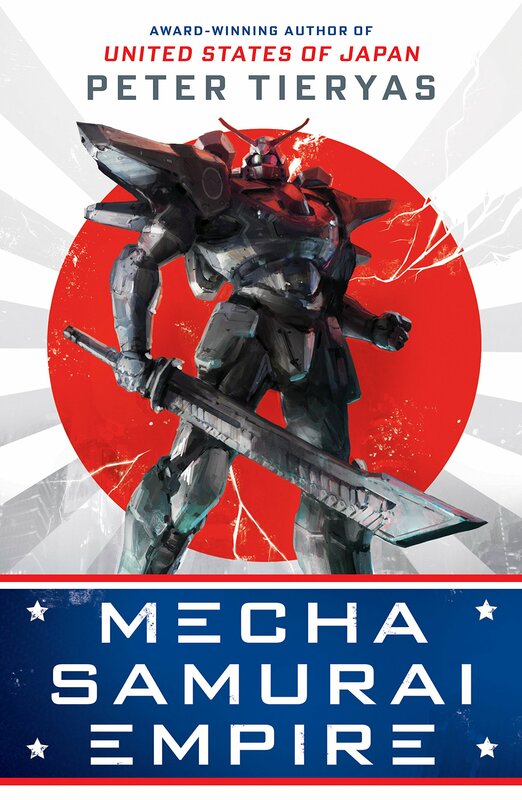 Peter Tieryas touched on this idea before in his 2016 novel, The United States Of Japan, now he is back with a follow up, Mecha Samurai Empire (A United States of Japan Novel). The novel follows Makoto ‘Mac’ Fujimoto a war orphan that has grown up in California, but this Cali isn’t the one we know and love, this version of California is in the United States of Japan. Before you start imagining a war torn world where American citizens live in refugee camps this California is surprising ‘normal’. Peter Tieryas spends some time showing us how average this world is by showing us some of the most mundane activities like eating with friends, to the more glamorous, like going to see your favorite band perform, the only difference is everything has this little twist on it. The book really drives home how we take out world for granted. The Axis Powers where far more brutal than the allies, do not get me wrong, The British Empire and the United Sates have both committed their own atrocities but during World War 2, these forces where clearly on the side of the angels. Mecha Samurai Empire Spares no time showing you how brutal the regime is in the treatment of its civilians and before you stop me and point out that this book is set many years after world war 2, I will remind you how brutal the Japanese Empire actually was, simply look up the Nanking Massacre, and the regime that we see in this book is an accurate portrayal of what the real regime probably would have been like had it not been defeated. Though I am sure many of you are wondering about the mecha and what can I say, this part of the story does not disappoint. Peter Tieryas looks at mecha in a very realistic manner and helps make you believe that they could have already existed haD history panned out a little differently. Trust me by the time you are done reading this you will be hoping for the power of one of these machines, that or you like me will happily sit down and spend an afternoon gaming. The best way I can sell you this is it is a lot like The Man In The High Castle, but mixed in with shows like the classic Gundam, which although they have giant robots never shy away from showing you the harsh realities of violence. Alternative history has never been so thrilling. Plus if I was to tell you that nerd god Hideo Kojima himself was a fan of the series would that help win you over?